If you want to become a registered member please go to » Registration for your personal login. Taxagroup: Tick the checkbox of the taxagroup(s) you want to have displayed. You can choose more than one up to all ("Select all") taxagroups. Country: Tick the checkbox of the country (countries) you want to have displayed. You can choose more than one up to all ("Select all") countries. Tick "Europe (EU)" if you want to display all the taxa occurring in Europe. Taxa exclusively occurring in Turkey will not be included. Option "Display only taxa occurring in all selected countries": displays only these taxa that occur in each of the selected countries. Advanced search: offers you the possibility to search for a selected family, subfamily, genus or species. You can either enter the complete taxon ("equals"), the beginning ("begins with") or the ending ("ends with") of the demanded taxon name in the respective field. Higher taxonomic units can be included, excluded or displayed exclusively by choosing the respective option. Advanced display values: Author or shortcode can be displayed by ticking the respective checkbox. You can also search for different identification numbers (ID-AQEM (ID-fwe), AQEM/STAR shortcode, DV-Number, TCM-Code, Furse-Code, Perla-Code) by choosing one of them from the selection list. You can choose more than one up to all ("Select all") codes. Move your mouse over the image to explore the functions of the database. The queried taxa are displayed on the left hand side of the table. The queried countries are displayed on the right hand side of the table. The country abbreviation means that the specific taxon occurs in this country. Clicking the icon alongside the parameter name will give you background information on the ecological parameter as well as on the classification system, the abbreviations used as well as the number and percentage of classified taxa. Please note that you should allow pop-up windows to use this feature. Directly below the each ecological parameter you will find the information for which higher systematic units it is available. For the general availibility of ecological parameters see » Content overview. Tick - for example - the checkbox "Trichoptera" within the "Taxagroup"-selection. Tick the checkbox of the country (countries) you want to have displayed within the "Country"-selection. Click the button "Query ecological parameters" (only available if you are logged in). Select the ecological parameter that you want to query by ticking the checkbox left of the name of the parameter. If you want to have this (or another) parameter displayed within the "Results"-page, additionally tick the "display"-checkbox on the right hand side. The database offers the possibility to query not only one ecological parameter but also two or more parameters at the same time. Define the stream zonation preference (e.g. : all Trichoptera species living in standing water bodies and riparian zones of rivers indicated by 10 points within the "littoral"-field) and the feeding type (e.g. : no specification which means that all feeding types will be displayed) that you are interested in. For more information on the coding systems see » Abbreviations. Parameters can be combined with an "or"- or an "and"-relation on the lower end of the site. The "Results"-page offers a list of only those Trichoptera, that are living in standing water bodies and riparian zones of rivers. Additionally the feeding types of those species are displayed. The parameter for which a criterion was defined in the query is marked in colour. Abbreviations are explained as tooltips and on the » Abbreviations site. All queried results can be exported to a csv-file by clicking the "Export"-button (red arrow) at the lower end of each query result. Please choose the decimal delimiter that is enabled in the local settings of your computer to allow correct display of values. Note that due to auto-formatting reasons opening your csv-file in MS Excel can still change the format of your values. You can also choose if missing values should be exported as "empty cells" or as "0 values". Click on the booklet-icon on the right side of each of your query results (red arrow) to view the correct citation and the underlying references per species and ecological parameter. For one specific organism group and one specific ecological parameter it may be necessary to cite several references! To facilitate this procedure click on the reference list-icon in the headline of each queried ecological parameter (orange arrow). As a result a complete reference list will be displayed. You can easily copy and paste this list into your personal reference list. Additionally, you can click on the grey headline "» Information generated from" to view all underlying references. Click on the "Export"-button at the lower end of the list to export this information to a rtf-file. The TET was developed to create standardised taxalists according to the freshwaterecology.info taxonomy. It is available for fish, macro-invertebrates, macrophytes, diatoms and phytoplankton. Choose the number of samples that you want to enter in the field No. samples with the according buttons. Up to 230 samples are possible. Enter any unit you need in the field Unit. Click Apply to transfer these setting to the Taxalist below. Note: You can change the names of the sample as well as the unit directly in the Taxalist and have e.g., different units for different samples. The number of samples can be amended or reduced at any time, even if there are already taxa/species in the Taxalist. Please note that if you amend samples with different units, those already in the Taxalist will stay as originally entered. If you reduce samples already entered values will be lost. If you want to view all available codes tick the checkbox Show codelist. Choose an organism group from the selection list Organism group. Enter at least the first three letters of the genus that you want to insert in the Taxalist in the field Genus and choose then the according genus from the now opening selection list. Enter at least the first letter of the species/taxon that you want to insert in the Taxalist in the field Species and choose then the according species/taxon from the now opening selection list. 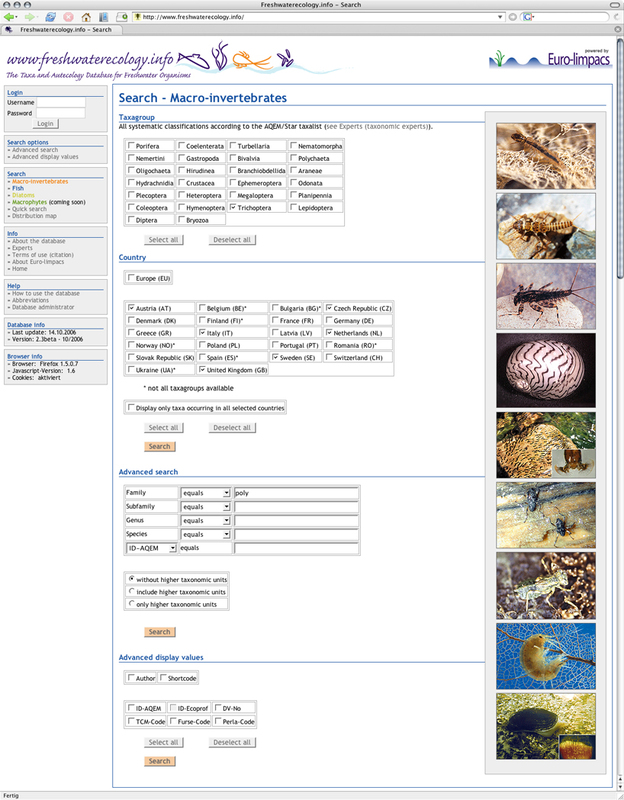 Note: You can use * to view the complete list of species/taxa belonging to the selected genus. You can move from the Genus to the Species field also using the tabulator key. Click Transfer to taxalist to transfer the selected species/taxon to the Taxalist. Enter the values (numbers, percentages, etc.) of the species/taxon in your sample fields. Note: You can move from one value-entry-field of a sample to the next using the tabulator key. Tick the checkboxes cf. or juv. if you need these additions. Click the Delete button, if you want to remove a species/taxon from the list. After having entered all your species/taxa, choose your preferred export option (crosstab or list format), and then click the "Export"-button to export the complete taxalist to MS Excel. Note: If you enter different organism groups the TET will remember the current entries of each organism group; to get a new and empty form, just press the reload button of your browser. 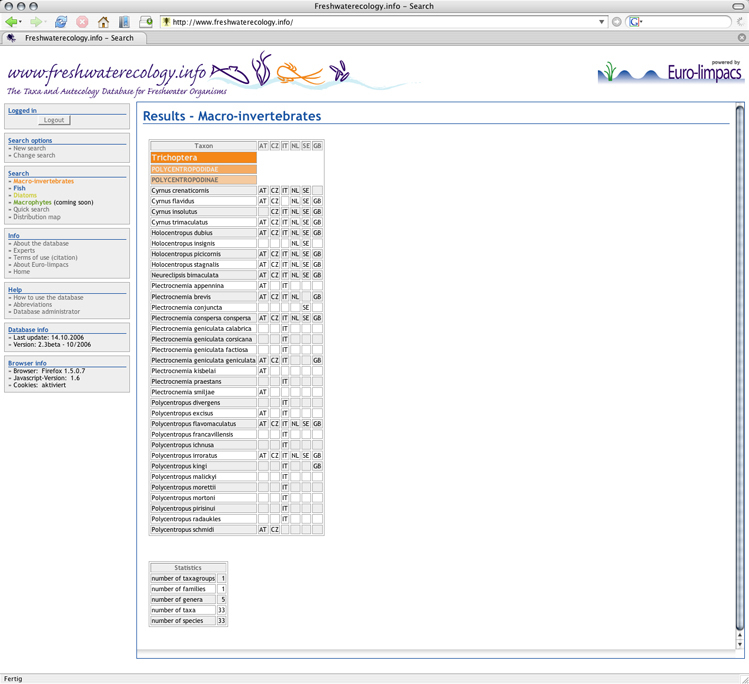 The TVT was developed for linking and comparing your own species list with the taxonomic backbone of freshwaterecology.info. It is available for fish, macro-invertebrates, macrophytes, diatoms and phytoplankton. This tool can also be used to upload a species list, link it with the ecological parameters of interest and download the dataset again. This export function also includes the export of all references used. Note: the TVT can be used to upload csv-files or xls/xlsx-files created in MS Excel. Choose the file that you want to validate from your local directory in the field Taxalist file. Use the fields Taxonname column to define which columns of your upload file contain the taxa names. Tick the checkbox 1st row is header if the first row in your upload file displays a headline. Choose the csv delimiter and the csv enclosure (according to your upload file) from the selection lists. Click Upload to upload your taxalist file. The field Status shows the current status of your uploaded/corrected taxon. The field Exclude allows to exclude taxa from the export, which were not identified by the TVT. The fields Valid taxon name show the taxa names of the freshwaterecology.info taxonomy. The cells within Valid taxon name are marked in green, if a taxon was correctly identified by the TVT and therefore corresponds with the freshwaterecology.info taxonomy. The cells within Valid taxon name stay empty, if a taxon was not identified by the TVT. The fields Imported file display the original headlines and content from your uploaded file. Click into the cell Genus within Valid taxon name. Type the first three letters of the genus and then choose the genus from the selection list. 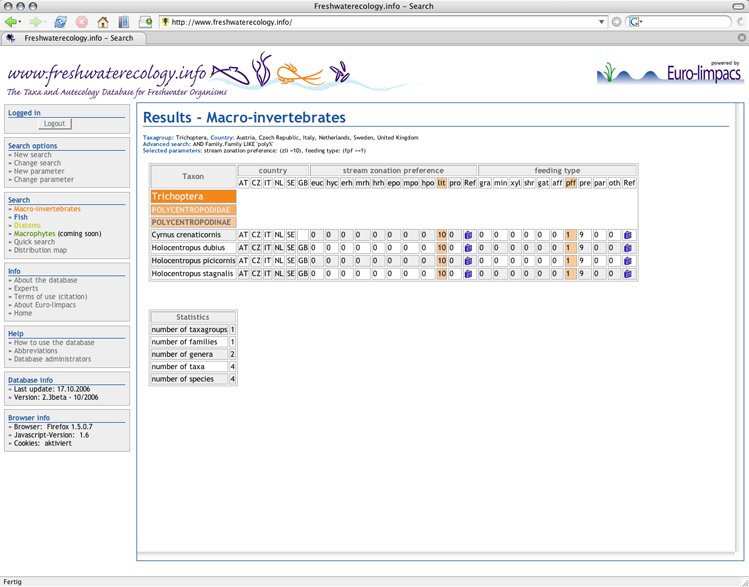 Click into the cell Species within Valid taxon name. Type the first letter of the species or press SHIFT++ (Win) or ALT++ (Mac) to see the whole set of species belonging to the selected genus. Select a species. Continue with this process until you have removed all empty fields. Choose the addional export options in the field Advanced taxon values. Choose the ecological information that you want to export by ticking the checkboxes in the selection list Ecological parameters. Please choose the decimal delimiter that is enabled in the local settings of your computer. Please choose if missing values should be exported as "empty cells" or as "0 values". Click the "Export"-button to export your validated taxalist with ecological parameters to csv-format.